CHAVIGNY LACHEVROTIÈRE, FRANÇOIS DE, esquire, seigneur; b. 6 July 1650 on the Île d’Orléans, son of François de Chavigny and Éléonore de Grandmaison*; buried 14 Feb. 1725 at Deschambault. 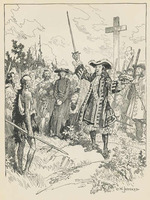 In 1670 he was one of the partners of the explorer Daumont* de Saint-Lusson, who was sent by Talon* to look for a copper mine in the Ottawa country. The following year, at Sault Ste Marie, a report was drawn up of the proceedings by which Saint-Lusson took possession of the western country, and on it appears Chavigny’s signature. Although Jolliet* and Chavigny signed in a notary’s presence a contract dated 1 Oct. 1672 and declaration dated 3 October in connection with new expedition to the west, Chavigny does not seem to have taken part in this expedition; it was put off till the middle of May 1673, and it is known that he was at Fort Frontenac in July 1673, at the time of the inspection by Frontenac [Buade*]. During his missions Chavigny rendered valuable services which, however, received scant recompense. On 7 April 1674 his mother bequeathed to him the fief of La Chevrotière. Without neglecting the development of his seigneury, Chavigny took on a job in 1712 as an employee of the Tadoussac trading sub-concession. His first wife, whom he had married at Quebec in June 1675, was Antoinette de Poussans. 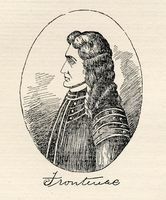 They had a daughter, Louise, whose godfather was Frontenac. 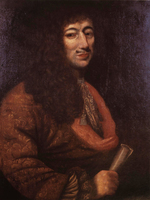 In April 1699, Geneviève Guion Desprez became his second wife. Of this marriage were born five daughters and a son, who was baptized François. In the autumn of 1724 Chavigny fell ill and died at the beginning of the following year, at 75 years of age. His wife lived for 30 years after his death. AJQ, Greffe de Romain Becquet, 19 juin 1675. Greffe de Louis Chambalon, 18 avril 1699. ANDQ: Registres des baptêmes, mariages et sépultures. Jug. et délib. A. Roy, Inv. greffes not., III, 135, 269; XVIII, 232–33. P.-G. Roy, Inv. concessions, I, 157f. ; III, 68ff. Tanguay, Dictionnaire, I, 163; III, 267. P.-G. Roy, La famille de Chavigny de la Chevrotière (Lévis, 1916). Jean-Jacques Lefebvre, “CHAVIGNY LACHEVROTIÈRE, FRANÇOIS DE,” in Dictionary of Canadian Biography, vol. 2, University of Toronto/Université Laval, 2003–, accessed April 22, 2019, http://www.biographi.ca/en/bio/chavigny_lachevrotiere_francois_de_2E.html.